I had to have blood drawn today. By all accounts, it was a routine blood draw, due six weeks after the most recent change in my daily dosage of the medication that substitutes for my cancerous thyroid that was removed more than seven years ago. But because I’m also due to see my endocrinologist next week — for, by all accounts, a routine, regular visit — the three standard blood tests I always have to check my thyroid hormone levels included a fourth, which I have only a couple of times a year: thyroglobulin. Thyroglobulin. My cancer marker test. It sends a shiver down my spine and puts an immediate lump in my throat whenever I see it on the lab request form. For thyroid cancer patients, the goal is to have an “undetectable” thyroglobulin level. We shouldn’t have any thyroid cells left, so detectable thyroglobulin, which indicates thyroid activity, isn’t a welcome finding. But in a certain portion of patients — including me — thyroglobulin never drops to “undetectable.” Maybe it’s more cancer or maybe it’s just some benign cells that are stubbornly staying put. Our doctors watch the trend line through repeat blood work: is it rising? If so, how quickly? We watch and wait. And watch again. And wait some more. In my case, there’s no indication that there’s anything to worry about. My most recent neck sonogram was good and my thyroglobulin has been close to my lowest level ever. But there was still a shiver down my spine and a lump in my throat. They were there as I printed out the lab forms, bundled up Katie, my infant, for the ride to the lab, and impatiently waited to have my blood drawn. There was nothing to do but wait for next week’s appointment and the lab results. I know now, after so many months and years of this process, that once the results come I will be able to release a giant breath I didn’t even realized I was holding. This time, I got home and looked down. 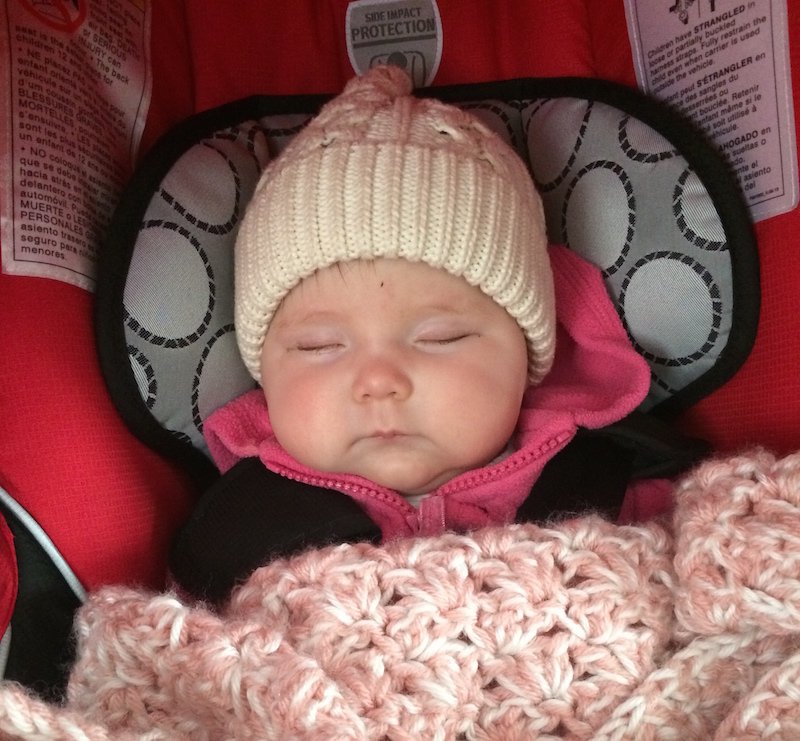 At my feet: a baby, sleeping soundly in her car seat after the quick trip out. I smiled and felt some of that relieved breath escape, feeling so thankful. Seven-plus years later, I’m still here. This disease didn’t keep me from knowing my daughter and her brother. The lump in my throat was still there, but this time it came not with a shiver, but with a happy tear. A version of this post originally appeared on A Storybook Life. Michele Mariani Vaughn is a wife, mom of two, cancer survivor, and writer living in Washington, D.C. She blogs about life after cancer and infertility — as well as random musings on life as a transplanted Bostonian, a devoted fan of the Red Sox, and an infrequent and slow runner — at A Storybook Life.